The Alfa Club Croatia chose the landmark football stadium in Split as the venue for its autumn meeting which drew Alfa Romeo owners' from all over Croatia and as far as Italy and Germany. After successful meetings in 2005 and 2006, the Alfa Club Croatia decided that its early autumn meeting would be organized again in Split. Split is the second big city in Croatia and the biggest city on the Adriatic coast. It is also usefully connected with many ferry lines from Italy. These meetings have quickly become traditional Alfa Club events, which also built on the 11th meeting of Alfa Club Croatia which in the spring of this year celebrated his second birthday. However last weekend a beautiful sunny day for all Alfisti started at 10:00 as the participants gathered on parking forecourt of the Autocommerce dealer in Split. Sightseeing and photographining Alfa Romeo's from all over the country could begin. In salon of Autocommerce were on show all current models of Alfa Romeo cars. 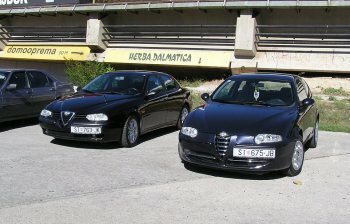 A big column of more than 70 Alfa Romeo models was in place by late morning and at 12:00 they began a drive to the centre of Split where the main meeting was scheduled to take place. Alongside the most beautiful stadium in Croatia – Poljud - was perfect for taking pictures of the Alfa Romeos taking part. The fist event at the stadium was a drive session to demonstrate skilfulness. Awards were excellent. The first award was the Alfa Romeo GTA Chrono Rattrapant. All together there were 25 drivers, including 3 excellent female drivers. Drivers went out on to the trail, going one by one. After that followed the first of the individual timed laps which would find the overall winner of the contest, and of the first 10 drivers going through to the second lap, was one lady pilot in a very good fourth place. However before the second lap got underway it was time to shared out the prizes for the most beautiful Alfa Romeo car present at the day. The most beautiful Alfa Romeo cars were chosen by a commission of five accidental visitors. The prizes were won by a glorious red Spider which came from from Split, and the owner of an immaculate Alfa 166 who had come from Germany. The winner of the second timed run was driver of Alfa 145 1.6 Boxer from Rijeka, while second place was taken by a driver from Krk, at the wheel of an Alfa 147 JTD. Third place was a pilot from Sibenik behind the wheel of an Alfa 156 2.5 V6. In fourth place was the fastest lady, in an Alfa 145 1.6 Boxer from Zagreb. There was also a lottery in which took part all Alfisti. Finally the Alfa Club Croatia's organisers prepared a surprise event for which there would be seven male-female couples taking part. The object wasn't to be the fastest: the winner was to the woman who in two of the track made her passenger least nervous. Blood pressure and the pulse was measured after the run and showed that the winners were a couple from Split, driving a black Alfa 156. After that event the meeting was set to end.